Here's my card for this month's SugarPea Designs Mix It Up challenge. 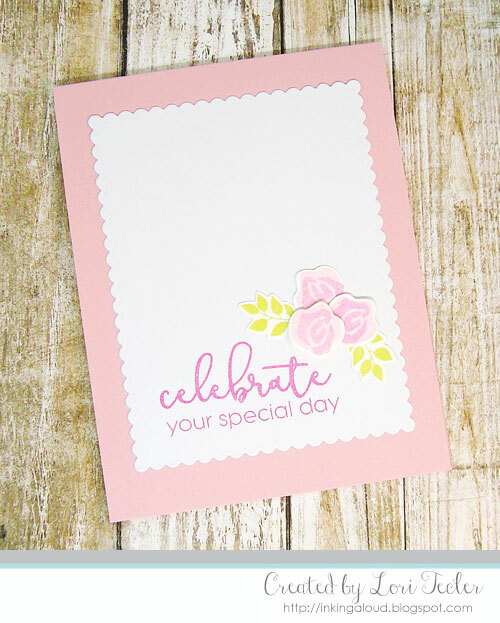 I paired the sketch with elements from the inspiration photo (the rose image and color scheme) for this simple card. I stamped up a trio of roses and a pair of leafy branches using stamps from the SPD Funky Wreath-Spring Addition set, then used the coordinating dies to cut out the stamped images. The base of the flower was stamped in pale pink ink, then I added the detail image on top in a darker pink ink, stamping off once before stamping on the image so that there would be less contrast between the two shades of pink. After settling on an arrangement that I liked, the images were adhered to a white scallop edged panel cut with one of the Birthday Journal Card dies. Two of the roses were adhered with foam tape to give the arrangement a bit of dimension. I added a sentiment from the Celebrate All the Things stamp set to the left of the floral cluster. The mix of fonts works well with the pretty florals. I adhered the finished panel to a coordinating pink card base. So clean and simple and so very pretty! I love the CAS style of your card along with this soft color palette, so pretty! Thanks for joining us at SugarPea Designs!